This is a sponsored post. Pawsitively Pets only shares information we feel is relevant to our readers. All thoughts and opinions are our own. I'll admit that it doesn't get extremely cold where I live in Texas, but there are days when I'd definitely rather stay inside. I know many of our friends have had a lot of snow lately. What do you do when your stuck indoors due to cold weather? It's easy to want to stay in a nice warm bed all day, but this is actually the perfect opportunity to get some much needed housework done for me. Particularly cleaning my carpets. My carpets are far from perfect. They are a bit old and decorated with a variety of stains here and there. It can be a tough chore to clean them at times, but fortunately I've found a product that works well. As my dog, Shiner, becomes older she does have a few more accidents inside the house. I always keep Spot Shot Pet on hand for this reason. 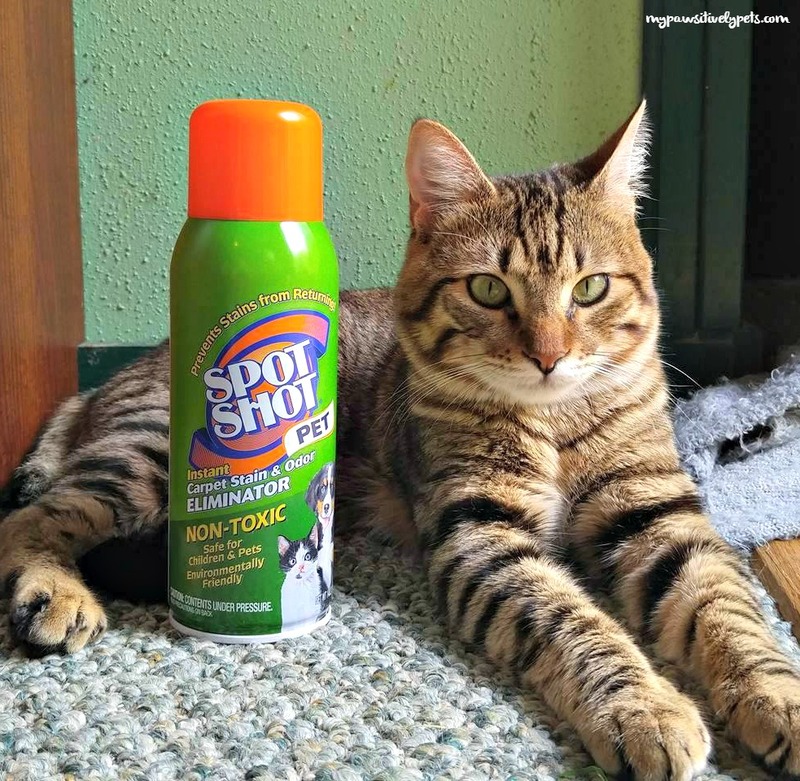 Spot Shot Pet Aerosol is proven to remove the worst pet stains including urine, feces, vomit, and tracked in dirt, mud, and oil. Spot Shot Pet permanently removes the toughest stains and odors and prevents them from returning. It has Anti-Resoiling agents that protect carpet and keep stains from returning. I know that many of you are wondering if it's safe to use around your pets and the answer is yes! 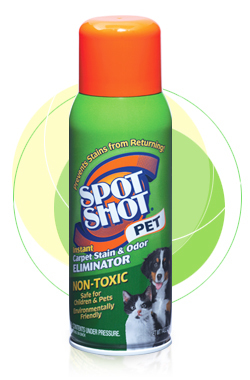 Spot Shot Pet is safe for pets, kids, and the environment when used as directed. It's non-toxic, contains no phosphates, has recyclable packaging, and is not tested on animals. What have I been using Spot Shot to clean this winter? I use Spot Shot Pet to clean all of our pet accidents and then some. I have human kids too and they have their own accidents like drink and food spills. Plus, mud has been quite prevalent this winter with many rainy wet days. Everyone seems to be tracking mud into the house and onto the carpet. 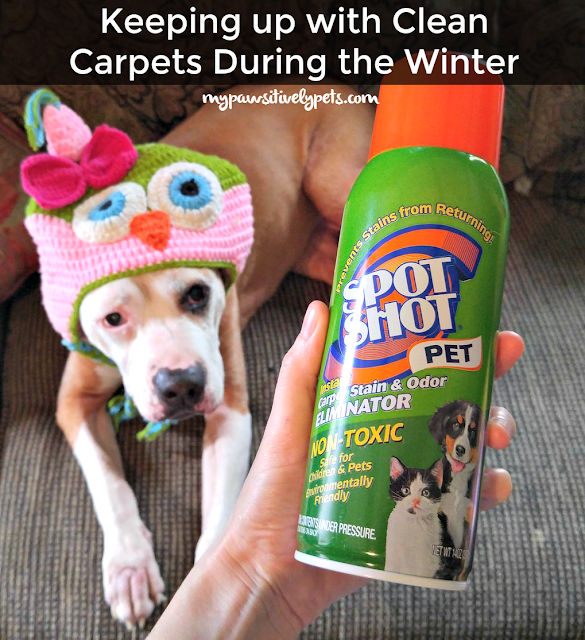 Next time you know you're going to be cooped up indoors due to cold and snow, grab some Spot Shot Pet and get ready to clean your carpets with your extra free time. It's a great cleaning product to keep on hand. You can find a nearby or online retailer that carries Spot Shot Pet HERE. You can also download a $1 OFF coupon HERE. For more tips on keeping your home clean, visit the Stain Fighting Community on Facebook. Could you use some help with your carpets this winter? We are partnering with Spot Shot for a giveaway! One winner will receive 4 cans of Spot Shot Pet. This giveaway is open to US residents only (void where prohibited by law), ages 18+, and ends February 24th, 2017 at midnight CT. To enter, simply fill out the Rafflecopter form below with as many entry options as you like. Good luck! Although this cleaner is safe for pets, I received some flack for using it because there are still a lot of chemicals; just not as many as other carpet cleaners. While I was trying to get my cat's diet right, he vomited regularly on our light carpet and it was driving my boyfriend nuts. I tried this product and was AMAZED by how well it worked. Cosmo rarely vomits now that he's eating a 100% canned and freeze dried raw diet, however, we still have mishaps and I always have this on hand. It's the best!!! Though I have a multi cat and multi dog household it is definitely pet stains that I have to clean up the most; most often it is cat vomit or hairballs, though on occasion my male cat or one of my dogs will decide to protest who knows what and urinate somewhere on the carpet and then of course every male animal in the house will urinate on top of it until I find the spot and try to clean it. This stuff looks like it works really well. We get a lot of puke stains! In the winter my little dogs have more accidents than usual in the house because it's cold and wet outside and they don't want to go outside. Kandy, our 17 1/2 year old spaniel mix, lately hasn't been able to make it to the door in time when she has to poo and is having accidents in the house as well. They keep me busy cleaning! The most common stains I clean up are dog/cat throw up. Sometimes dirt or mud from walking the dogs. We've been using spot shot for years. Pretty good stuff. i have lots of pee and poo to clean up. i have to put down tarps in the house in some rooms because my oldest dog cant hold it anymore for very long. i also have potty pads down for my 2 younger girls when i go out. i dont know why but they cant hold it for more than a few hours. they are house trained but sometimes i feel they do it just to get back at me for leaving them. i stay at home a lot especially for my oldest dog since she is not well. Mainly urine, but occasionally vomit too. This would help the most with the latter. Thanks! Spot Shot Pet sounds like a great product. Every animal has an accident now and then, and it's nice that this works so well. My cat Charley cleans himself and also cleans his sister every day. He has hairballs at least twice a week. I use Spot Shot and it's a life saver! Our #1 is urine, followed by vomit! My boy cat marks! We have to clean up after him all the time. That spot shot would definitely get used around here! It's funny,(in a very unfunny way) my boy cat is the marker, and my girl cat is the barfer. They've got it covered. Sad face. i have a Jack Russell that's 12 and from time to time she doesn't eat so she gets sick right on my carpet!